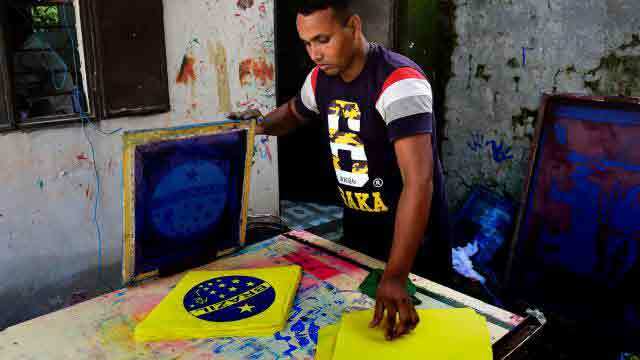 Dhaka, May 23 (Just News): Flagmakers in Bangladesh are doing a roaring trade weeks ahead of the World Cup, but no-one is interested in the home nation’s colours-the money is all on pennants for Lionel Messi’s Argentina and Neymar’s Brazil. Textile printer Kamal Hossain owns one of scores of small, hot, sweaty workshops in the Merajnagar of capital Dhaka, working flat-out to produce flags and pennants for the local market ahead of the tournament in Russia. “For the last two months I have been working non-stop,” said Hossain. “There are days when I do not even get two hours of sleep,” added the 40-year-old, barely lifting his head from his screen-printing machine. Bangladesh is traditionally cricket territory, but every four years the country of 160 million people-whose national team is ranked 197th out of 202 in the world by FIFA-goes World Cup crazy. Flags in the colours of Argentina and Brazil take over the streets, and printers in Merajnagar are expecting to produce hundreds of thousands before the tournament starts in Moscow on 14 June. Homes have been converted into makeshift printing and sewing plants as orders pour in from across the country. “Every day we’re printing and making thousands of flags. Today we’ve already printed 11,000 Argentina pennants,” said Hossain. Fans across Bangladesh hold flag-waving processions to honour their favourite team. Last week, a video of supporters marching with a 200 metre-long Argentina flag in the northwestern town of Madarganj went viral on social media. The impoverished country first saw live World Cup matches in 1982. But it was the 1986 tournament, when Diego Maradona single-handedly helped Argentina win the trophy, that cemented football into the Bangladesh psyche-along with a new favourite team. “The craze for Argentina is still going strong, Maradona is gone but Messi is the new superstar,” said Faruq Mia, a flag hawker who came from neighbouring Narayanganj district to stock up. Mia bought 500 flags last week, made a big profit and so needs 500 more. He will be cheering for Argentina. Factory owner Selim Howlader expects to sell several hundred thousand flags as “World Cup fever came early in the country, months before kickoff”. “In 2014, I sold more than 80,000 flags. Most of them were sold during the World Cup or just days before kickoff. Now I am selling 2,000-2,500 big flags and 10,000 pennants a day and the World Cup is still weeks away,” said the happy 33-year-old businessman. Howlader employs 25 workers and said about 2,000 people in all are working in Merajnagar’s flag factories. Messi and Neymar’s teams dominate by far Howlader’s order list. “Argentina and Brazil are the two most popular teams in Bangladesh,” he said. Some four million people work in Bangladesh’s 4,500 apparel factories, who provide billions of dollars worth of clothes to top retailers around the world. But experts and rights groups say that while there has been progress in improving conditions for garment workers in the country, they still often face long hours, dangerous working environments and dismally low pay. The flag boom means extra income for poor workers like Nargis Akhter, 28, and her husband Mohammad Iqbal who work in Howlader’s factory. “On an average every day we make 3,000 taka ($35),” said Iqbal. An average garment factory pays about $70 for an entire month’s work-among the world’s lowest wages for such a job. “I wish the craze for flags would go on for many more months,” said Akhter, with a smile.